What Would You do with 24 Hours of Free Time? What would you do if you had 24 hours of Free Time? This was the question I found myself answering last weekend. The seed was planted a few months back, when one of the Puttypeeps in the Tribe approached me with an idea: what if, as a community, we pulled an allnighter and worked on whatever multipotentialite projects we wanted? The idea evolved, Erin took the lead, found a few awesome volunteer huddle leaders, and there we were. There was only one rule to Puttython: Spend this time doing work that you wouldn’t otherwise have to do. This might involve diving into a new interest or working on a project that had been on your back burner list forever. You could spend the time reconnecting with old passions, cycling through a number of different activities, or even just put in a solid chunk of time on one priority project. We left it open. There are an infinite number of ways to be a multipotentialite, so why limit the ways anyone should use their time. 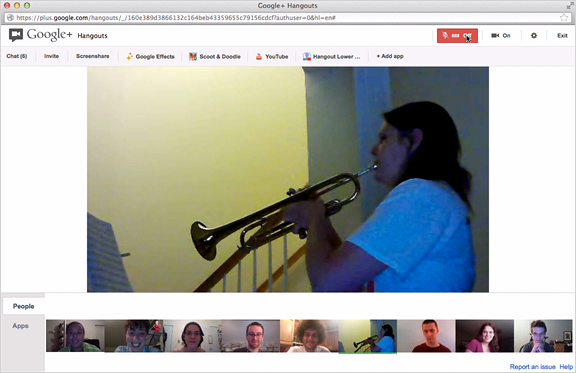 We had check-in huddles every 4 hours on G+ Hangouts to talk about how things were going and what we were getting up to. Puttython started at 8am Pacific with our first huddle. The great thing about 24 hour events, is that people participating from all over the world could participate. Unlike with most events, timezones weren’t an issue. My strategy for the day was to start with a list of passions that I’d been wanting to get to, and just pick and choose as I went. I know mornings are my most creative time of the day, so I intentionally started with the activity that I thought would bring up the most resistance: making art. I studied visual art in Cegep, but it had been nearly ten years since I’d really touched a paint brush or cracked open a sketch book. I set up my new water colours, coloured pencils, a few images that I thought I might use for collage, and a blank sheet of paper. And then I froze. All of a sudden, that blank canvas, staring up at me, was the most intimidating thing I’d ever seen. I tried painting a few things quickly, but they felt forced and I couldn’t stop myself from being critical or worrying about having something good to show the Puttypeep at our next check-in huddle. It was pretty amazing how much emotional baggage this activity brought up for me. But then I calmed down, and I took “showing the Puttypeep” off the table. I just decided that I wouldn’t, or didn’t have to, show this to anyone. It was about the activity itself– enjoying the act of making art. It was not about the end product. Then I sat on the living room floor, grabbed one pencil, my sketch book, and I began using a technique that I learned in a drawing class many years ago: I drew without looking at the page. I just focused on the mess of fur that was curled up next to me. For fifteen minutes, all I did was stare at Grendel, move my pencil around, and keep my eyes off my page. Finally I looked down, and you know what? It wasn’t bad! I put that sketch aside, and started another one, this time feeling a bit more confident and taking a few more peeks at the page. I felt myself being transported into a flow state and the Resistance melted away. 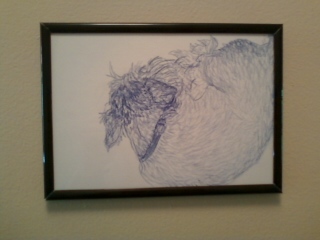 Half an hour later, I had an awesome sketch of Grendel, which I did show the Puttypeep at our next huddle, and is now hanging proudly on my wall. This was a real learning experience for me. Apparently I had a lot of fears around this particular medium, since it was something that I had “given up” years ago. Subconsciously, I felt like I had to abide by the rules or maybe it felt like I had something to prove. All of this lead to overwhelm and paralysis. But in focusing on doing the activity for no external purpose — no deliverables, no praise, not even a nice looking drawing — I was able to have fun and, ironically, produce nice looking work. I shared my realizations in our next check-in huddle. We were joined by a few new faces. Erin told us about the quilt she was making, and Margaret skipped the huddle because she was all muddy from building biointensive garden beds. The next four hours flew by. I took a Zip Car to Fred Meyer to buy some ingredients for the new Paleo dish I wanted to make, picked up some coloured thread for a project, and some frames to hang things on my wall. I also took Grendel to the dog park. The time was gone in a flash, and there we were in our next huddle. Hugh told us about how he’d been planning on working on his new website, but instead ended up creating an app to track who in his family had last fed the cat. What a beautiful display of multipotentialite behaviour! Setting out to do one thing, but then following an entirely new thread. Allowing yourself to get pulled down the rabbit hole. During the next few hours I did two things: First I attempted to make a friendship bracelet with the thread I’d bought. That was a fail. 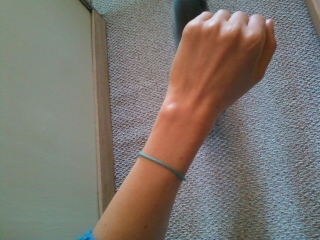 It turns out, I don’t really like friendship bracelets. At least not the ones I was attempting to make. But I did decide that I liked the way 1 thread looks on my arm, and so I created a new line of minimalist bracelets! Ha. Next, I practiced my violin in preparation for the first ever Puttytribe Open Mic! It was taking place at the twelve hour mark, and Michael was hosting. I had to decide whether I was going to play a piece that I knew well and was pretty easy, but sounded impressive, or whether I was going to play the difficult piece that I am currently working on. I went with the hard one. After all, I was enjoying embracing imperfection. May as well keep the ball rolling. The Open Mic was outstanding. Lori played the trumpet, Thea played the piano and sang, I struggled through La Folia, and Michael pulled out his guitar and serenaded us with some Oasis. It was an awesome experience, performing in a safe space, with other supportive multipotentialites. It was getting late so I didn’t do anything too creatively demanding over the next few hours. 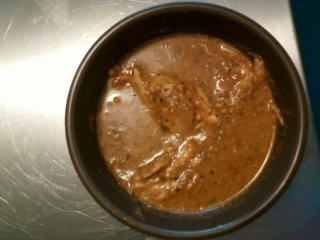 I prepared the new Paleo dish I was attempting, and set the Crockpot on low for 8 hours. I opened an investing account through e-Trade, which is something I’ve been wanting to do for a while. I’d been inspired by the workshop that Joel taught in the Puttytribe a few weeks earlier on personal investing. I dropped in to the midnight check-in huddle. Everyone was really tired, it was 3am for the East Coasters. But it was nice to catch up and see how projects were coming. Then I went to bed and skipped the 4am huddle. Props to Erin, Harrison, and whoever else was there though. You guys are troopers. I woke up to a delicious smelling apartment, just before the final 8am huddle, and we all jumped in to talk about how the 24 hours had been for us. We agreed that we would DEFINITELY be doing this again. Then I had some soup for breakfast. Puttython also gave me a real taste for the value of Free Time. Like I discussed in last week’s email, I’ve been trying to incorporate more play into my life. More “pointless activity,” and un-scheduling. This is a challenge for me, but so far it’s been tremendously rewarding. I also just loved going through this with other Puttypeep. The Puttytribe has evolved into this platform for multipotentialites to create their own events, put on their own workshops, collaborate together, and be supported through their own personal projects by the community. It’s what I’ve been striving to build. Not just a space for me to teach and share my views, but a platform through which the multipotentialite community can innovate. Happiness is putty in your hands… or is it being a bit of putty? I Participated in a Puttython! If you had 24 hours to express your multipotentiality, how would you spend the time? Your soup looks delicious! I’m putting the ingredients on my grocery list for next week. I want to try it and I think my daughter will enjoy it, too. I’m looking forward to the next Puttython. I have a still life set up my dining room I’ve been meaning to draw for over half a year now. I think that’s going to be my focus for the next thon. Yeah, it was delicious and crazy easy to make. Let me know how you and your daughter like it. I know, I’m itching for the next Puttython too. I’m glad my inspiration to get you to start investing was a part of your personal Puttython. But more importantly, I’m just glad this event existed. I wish I could have participated along with all the other fabulous folks who did some pretty snazzy things in those 24 hours. Way to go Erin with all your work to pull this off! I know it was a team effort but I know how much you rocked this. You rock Joel! So glad you’re a Puttypeep. And for going along with this nutty project! I had such an amazing time and learned all kinds of unexpected things. Here’s to the next one! For me, it’s kinda the same with drawing, not something I do often, but have always done well -yet it’s like I need to give myself permission to spend some time screwing up and starting over, not knowing what I’m doing and getting into the flow. I know if I choose the easier thing (for me it’s been music), then I’ll just do that, but I always want to try to get the flow going doing something new / challenging. It often involves alot of struggle, like it did for you and probably alot of other multipods here. I am a newcomer here, but I am looking forward to joining the tribe when the doors open! Awesome idea btw, Erin! The War of Art has definitely been a huge influence on my work ethic. Pressfield rocks. Interesting that music is the interest that’s easiest for you to get into. Writing’s like that for me. I’ve actually been thinking about shipping my guitar out to Portland though, so I can get back into songwriting. I think there will be quite a bit of resistance around it, since it was such a big part of my life growing up. But after tackling drawing last week, I’m ready to revive some other old interests. I feel like we can derive a lot of confidence by facing/overcoming Resistance. I’m imagining a whole 24 hours of creative time to be a huge luxury! I would spend 2 hours scanning and adjusting all the remaining images for my new book. Quick yoga workout then get into the choc bread with mature cheddar for lunch. Doodle on a notepad over a bunch of grapes. Challenge myself to complete a small 4″ square woodcut in an hour, and ink/print it. Go back to the book and place all the images in Indesign. Do a painting larger than A4 with acrylics not just pen and watercolours. Welcome back the family, who arrive bearing wonderful dinner. Eat chocolate mousse, read Edward Gorey stories to the kids. Or Andy Stanton. Something hysterical. Have a music session to wear everyone out. Once they’re all asleep, record a meditation or podcast on the mac. Quite possibly a large glass of pinot noir. I would have to collapse into bed then, but would keep my phone and write evernotes all through the night whenever inspiration arrived. I wish I had known this was happening. I am on google plus and would have loved a hang out. 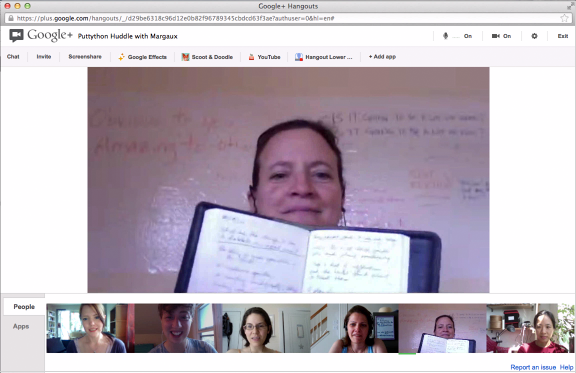 Several writers I know hold silent writing hangouts with 30 minute breaks to discuss the work. 24 hrs of free expression? Hmm. I think I’d have to put art in there, music too, but it might be fun to revert back to my school art self and make one of those nail/string drawings I used to have fun with. The phone would be off for most of the day, except for maybe a period where I call old friends I haven’t been in touch with for a while. I’d also have to get together with people because one of the things I most love about being multipotentialite is how fun a rambling conversation can be… The more the merrier! and like this last time, I think I’d have to keep an eye out for some kind of fun or interesting event I could sign up for to get out and do something new. 24hrs really isn’t enough time. How about a whole puttython weekend??? PS You have company with the single thread bracelet movement – Madonna wore a single red thread on her wrist, apparently to symbolize that she’s a practitioner of Kabbalah.